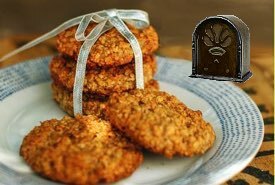 Grandma's vintage cookie recipes are quick and easy to make. And the old fashioned cookies taste so good compared to store-bought that you'll make them again and again. Be sure to try the homemade molasses cookies, and you will like the old time recipe for rock cakes that Grandma found in a newspaper. She wrote next to the clipping that they're "Real good." Molasses cookies were often made in the old days as molasses was used as a main sweetener in the kitchen. Grandma purchased it by the barrel for her cooking and baking throughout the year. 1/2 cup shortening, 1 cup sugar, 2 eggs beaten, 1/2 cup milk, 1/2 cup molasses, 3 cups flour, 3 teaspoons baking powder, 1 teaspoon cinnamon, 1/2 teaspoon cloves, 1/2 teaspoon salt, 3/4 cup seedless raisins. Method: Beat shortening and sugar to a cream. 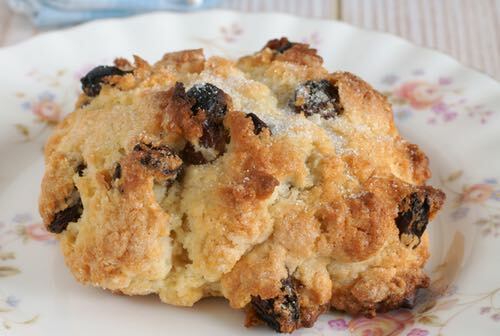 Add eggs and milk, then sifted dry ingredients and the raisins, which have been dredged in some of the flour. Drop by spoonfuls onto a greased cookie sheet, about one inch apart. Bake in a moderately hot oven (375°F) about 18 minutes. Four dozen medium-sized cookies. One cup lard, 2 cups molasses, 1 teaspoon soda, 1 dessertspoon ginger, 1 teaspoon cloves, 1 teaspoon spice, pinch of salt, flour enough to roll. Directions: Cream butter, eggs, vanilla, sugars. Add flour, baking soda, salt, pineapple, alternately. Add nuts. Drop on greased cookie sheet, bake at 350°F for 12 minutes. Makes 5 dozen. Ingredients: 2 cups raisins, 4 tablespoons milk, 2 eggs., 1 teaspoonful soda, 1 cup chopped walnuts, 1-1/2 cups brown sugar, 1/2 cup butter, 1/2 teaspoon cinnamon and nutmeg each, 2-3/4 cups flour. Cream butter and sugar, add beaten eggs, then add milk and other ingredients. Drop in small cakes on buttered pan and bake till done. 2 eggs, 1 cup butter, 1 cup white sugar, 3 tablespoons milk, 1/2 teaspoon soda, flour enough to make dough; roll thin and bake quickly. 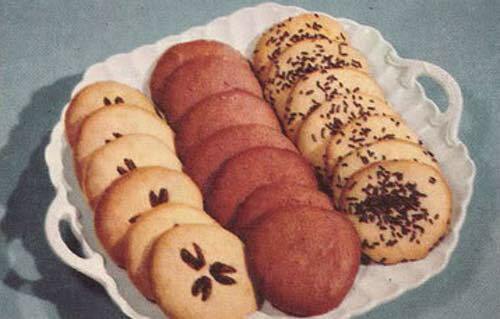 This vintage cookie recipe is like getting three great recipes on one! 1. Sift together 1 cup all-purpose flour, 1-1/2 teaspoons baking powder, and 1/4 teaspoon salt. 2. Put into bowl 3 tablespoons soft shortening and 1/2 teaspoon vanilla. 3. Mix in gradually 1/2 cup sugar. 4. Beat in vigorously 1 well-beaten egg. 5. Add flour mixture alternatively with 1-1/2 tablespoons PET Evaporated Milk. 6. Beat until smooth after each addition. Begin and end with flour mixture. 7. Divide into 3 equal portions. Drop one portion by teaspoons onto greased baking sheet. Bake in moderate oven (375°F) 12 minutes, or until brown. 8. Mix into second portion of batter 1/2 teaspoon cinnamon, then bake as directed above. 9. Mix into remaining batter 1-1/2 tablespoons cocoa, 1 tablespoon sugar, and 1-1/2 teaspoons PET Evaporated Milk, then bake as directed above. Here's a vintage cookie recipe for making raisin puffs. Put raisins and water in saucepan and cook until the water boils off. Cream sugar and margarine. Add eggs and vanilla. Sift flour, salt, and baking soda. Mix well. Add raisins with the flour. Roll dough into 1-inch balls. Roll balls in granulated sugar. Make sure the balls are well covered with sugar. Place balls on ungreased cookie sheet about 2 inches apart. Bake at 350°F for 8 to 10 minutes. 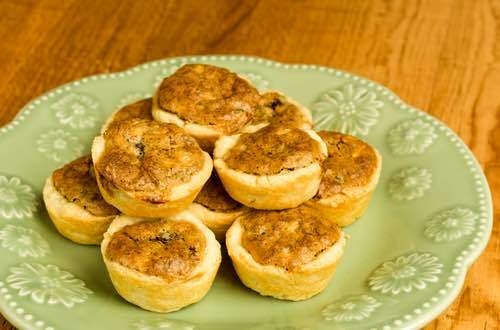 You'll love these amazing cookies which look and taste like miniature pecan pies. I got this vintage cookie recipe for Pecan Tassies from my mother-in-law many years ago. Blend the butter and cheese. Stir in flour. Cover and chill 1 hour. On a lightly floured surface roll dough 1/8 inch thick. Cut in 3-inch rounds with a scalloped cookie cutter. Pat into 1-3/4-inch muffin pans (or divide dough into 24 balls, press against sides and bottom of muffin cups). In a small mixing bowl stir together egg, brown sugar, butter or margarine, vanilla, and salt just until smooth. Spoon about 1 teaspoon of the chopped pecans into each pastry-lined muffin cup. Fill each cup with egg mixture. Bake in 325°F oven about 25 minutes or until filling is set. Cool, then remove from pans. Cover, chill to store. Makes about 2 dozen delicious Pecan Tassies.